"You’re Looking at Me Like I Live Here and I Don’t provides a poignant portrait of a woman struggling to express herself in a constricted world that eludes her understanding. We know that Alzheimer’s disease is common. This film teaches us that the dementia experience is unique, lonely, and intensely personal." "You're Looking At Me Like I Live Here And I Don't is the first documentary to truly present the perspective of the person with dementia. It is a great contribution to the understanding of Alzheimer’s disease and a respectful portrait of those who are afflicted." "We all know people who are suffering from dementia or Alzheimer’s. 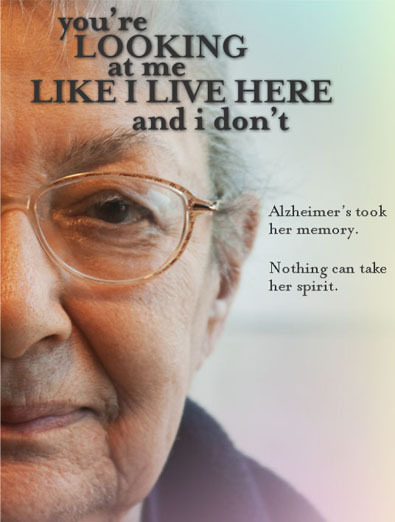 You’re Looking At Me Like I Live Here And I Don’t is a full immersion into the life of someone with dementia. The film is moving, funny at times, humane, but, most of all, loving in its approach to a disease that so many are afflicted with."